A Day Dreamer's World: Merry Christmas! Merry Christmas! Christmas has come so quickly this year it's unbelievable, and I've decided to make the most of it, wrapping my sister's gift up like it's pass-the-parcel and hiding all my Dad's favourite sweets! It's got to be funny! I just wanted to write a quick post to wish you all a fantastic Christmas, and I hope you all stay safe and warm in the awful weather that is currently pretty-much everywhere! Where I am, we had a hail-storm, snow, sleet, thunder and lighting all within a ten minute period a few hours ago, which is something I have never seen before! I really would like too see, when I open my book-shaped packages, which I hope I'm getting, that there will be some snow-showers. Just one. Anyway, I hope you find a lot of books under your tree or in your stocking, and that all of our books haven't weighed Santa's sleigh down too much! Thank you for supporting me throughout this year, and to the bloggers who sent me a Christmas card, I appreciate it so much! I now have them stuck up all over my bedroom! 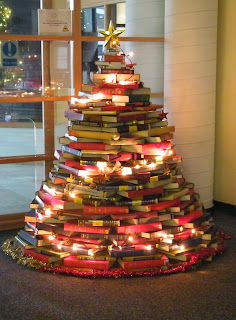 Have a very merry, bookish Christmas and a new-year full of the best books you can find! I'll see you on December 27th when I'm back after a short Christmas break to catch-up with the family I've been ignoring because I love talking to you some much!